2009 Launches – High Resolution Included! Renault Lotus F1 driver Robert Kubica has been airlifted to hospital following a car accident while competing on a rally. The incident, described as a high speed accident, left the Pole injured and he had to be airlifted to hospital. His co-driver Jakub Gerber was uninjured in the incident. While he has remained conscious throughout the whole incident, the extent of Kubica’s injuries are as yet unknown. Reports are variable, with some suggesting he has fractured a wrist, while others say he has broken both legs. Speculation as ever with such incidents is rife. Renault have released a minor statement, with a press conference that has been pushed back to 3pm GMT. Kubica is a well known Rally enthusiast, he and other drivers have competed in many events such as this one before. However with the incident potentially ruining the start, or all of his season perhaps drivers will now be banned from competing in such events by their employers. We will get a post up as soon as the press conference is over this afternoon with more information. Right now though, our thoughts are with Robert. This entry was posted on February 6, 2011 by f1fanatics. 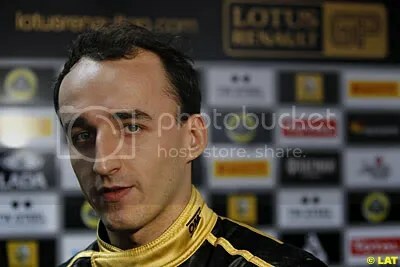 It was filed under F1 News, Lotus Renault GP and was tagged with Kubica Accident, Robert Kubica. Why not follow The F1Fanatics Blog on Twitter! Drive an F1 car with Philips & Williams! Click the flag of your country or country which speaks the same language as yourself to view.